It's 'Sew Crafty Friday'. I love seeing what crafty things everyone is working on. If you are working on something crafty, stop by and add your name to the Mr. Linky on Shereen's blog. This week I decided to knit some dishcloths. :o) I used the same color yarn for both, but in my pictures it looks like they are different shades. 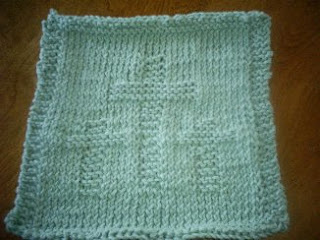 The first one I did has 3 crosses on it. Go here for the pattern. 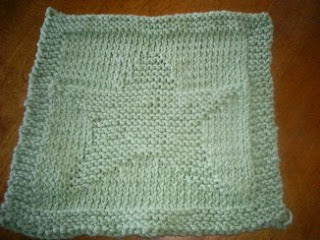 This is the star dishcloth. You can find the pattern here. They came out so nice. Too nice to use them for cleaning anything. lol It looks so hard to add designs to them. The one with the three crosses is great. I've been a chicken to try crocheting something difficult. Maybe once the afghans are done, I will give it a try. Thanks for participating this week. I for one can't wait to see what you will work on for next week. ;0) Oh, I just realized I never finished my comment on the cards from last week. Where did the week go? I hope you have a very blessed Sabbath. April 20, 2007 at 9:30 a.m.
Lisa! Those are SOOO neat!! They turned out absolutely wonderful!! And you finished two in one week??? that is great! THank you for sharing, they are really lovely!! April 20, 2007 at 11:14 a.m. These are so wonderful... I could never do that, you are very tallented. I love the one with crosses in it. April 20, 2007 at 1:35 p.m. Handmade dishcloths are really nice to have around. I've not made any myself, but a friend gave me one. I have to agree w/everyone else. Adding the pattern to them make them look extra nice. Great job! April 20, 2007 at 7:21 p.m. Thanks for stopping by. :o) My mom taught me to knit when I was younger. She can knit sweaters and socks etc., but I can just do straight knitting. The dishclothes have just the knit and purl stitches, so while it looks difficult, it's realy quite easy. April 24, 2007 at 10:41 p.m.
WOW! I'm very impressed. You have a very nice talent! April 25, 2007 at 2:09 p.m.